Historian and poet; born in Mor, district of Stuhlweissenburg, Hungary, in 1788; died there April 27, 1821. He studied at the yeshibah of Prague, among his fellow students being his relative Moses Saphir, the humorist. He subsequently became a corrector in the printing establishment of Anton Edler von Schmid in Vienna. 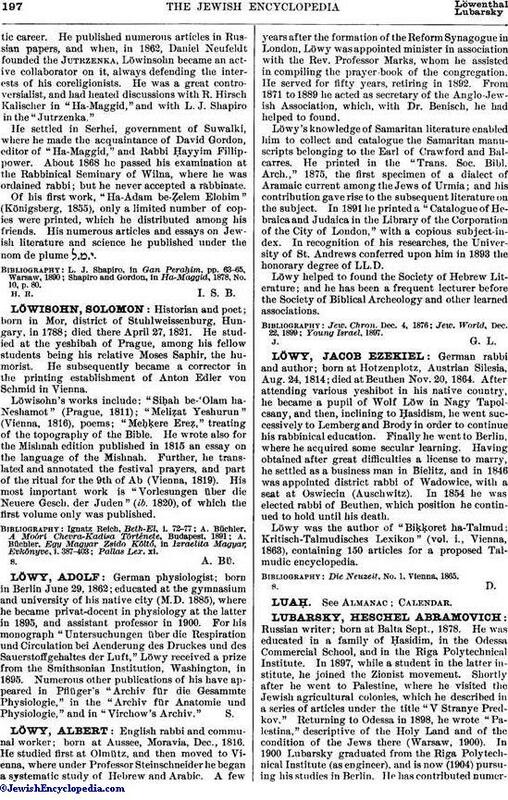 Löwisohn's works include: "Siḥah be-'Olam ha-Neshamot" (Prague, 1811); "Meliẓat Yeshurun" (Vienna, 1816), poems; "Meḥḳere Ereẓ," treating of the topography of the Bible. He wrote also for the Mishnah edition published in 1815 an essay on the language of the Mishnah. Further, he translated and annotated the festival prayers, and part of the ritual for the 9th of Ab (Vienna, 1819). His most important work is "Vorlesungen über die Neuere Gesch. der Juden" (ib. 1820), of which the first volume only was published.